Set of 12 Guatemalan Worry Dolls with Pouch in 100% Cotton, "The Worry Doll Gang"
Dressed in a variety of colorful dresses, 12 Guatemalan worry dolls are here to preserve ancient Maya traditions. Legend has it that the Maya Sun God gave princess Ixmucané the gift of solving people's problems. With time people started making dolls in Ixmucané's honor and they would tell her their woes, hoping she would solve them through the dolls. "This tradition is still alive," says Ana from the Lopez Garcia Family. "The idea is to have many worry dolls and trust each one with whatever troubles you. Once you've told them, you put them under your pillow. It is said that during the night, while we sleep, the dolls will whisper the solution to our troubles. 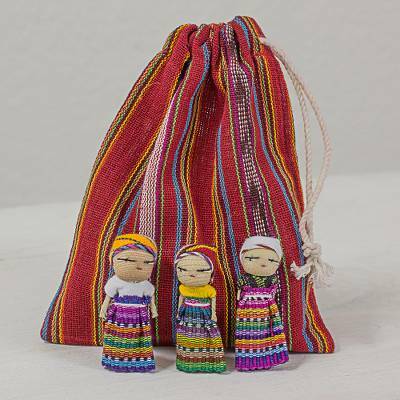 For us, crafting the worry dolls - muñequitas quita penas - is our main source of income.It allows us to provide our children with an education as well as a job for all of us." The set of 12 arrives in a pedal-loomed cotton pouch. Please expect slight variations in color and size as each doll is crafted by hand with available materials, rendering each one unique. You can find cotton figurines 'The Worry Doll Gang' (set of 12) by Lopez Garcia Family in decor accessories categories such as Cultural Decorative Dolls and Puppets and Cotton Decorative Dolls and Puppets. Enjoy exploring these sections for other Novica treasures. "Darling Gift for Any Age!" So far I've given this as a gift to my daughter and another for myself! Next up is a friend's 6 year old daughter. I love these little dolls - you just name a worry and they'll take it away. Beautifully made with such a nice pouch. "Gave all my worries away." The dolls are nicely made and so cute. "A dozen darling worry dolls"
These worry dolls are super cute. Each one is a bit different and has moveable little 'arms' on their sides. The bag, like the dolls themselves, is very well made. This set is a great buy! "these make very sweet gifts ...."
These sweet worry dolls became part of my Christmas gifts last year for friends and family, and I included a copy of the directions on how to place one under your pillow for better sleep. Each one has its own character and are beautifully made .....I really appreciated being able to share a worry doll with the people I love! These are really great things to have , i use one of them alot the other ones are on display on a dreser top. Great works ladies.